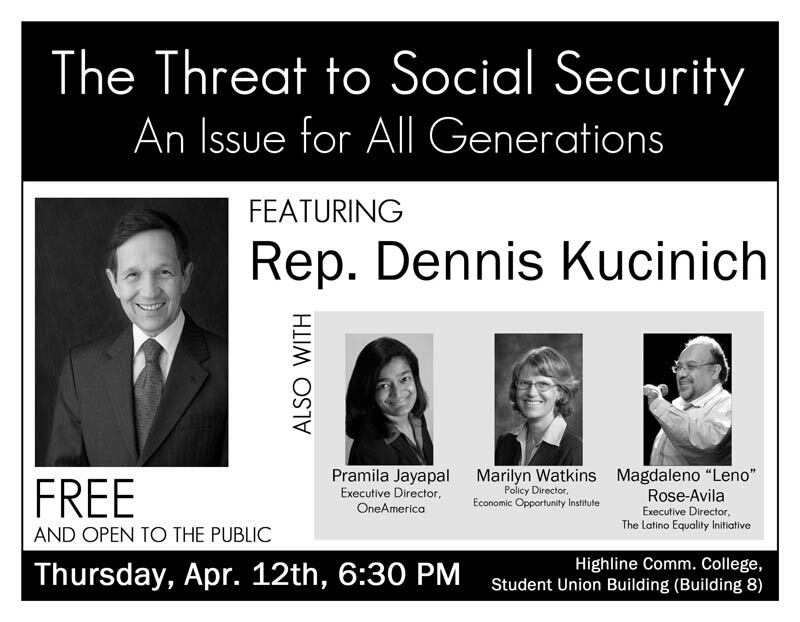 Representative Dennis Kucinich will be speaking at a forum entitled “The Threat to Social Security – An Issue for All Generations” on April 12th at Highline Community College in Des Moines, WA. The event will run from 6:30 – 8:30 PM in the Student Union Building (Building 8), and also feature Pramila Jayapal, Executive Director, One America; Marilyn Watkins, Policy Director, Economic Opportunity Institute; and Magdaleno Rose-Avila, Executive Director, The Latino Equality Initiative. The forum is free and open to the public – please mark your calendars.